Boston, Mass., circa 1910. "Crawford House." Plus: Schlitz, big teapots and an early payphone. 8x10 glass negative, Detroit Publishing Co. View full size. Submitted by DebbieC on Fri, 03/10/2017 - 6:44pm. I love this photo. My great-great grandfather Nathan (Nat) Prescott (originally Bruske) was a bouncer for the Crawford House. He was also a vaudeville performer, a horse-drawn ambulance driver, and later, a driver for Mayor Curley. I wish I could find more pictures of the inside the Crawford House and learn some stories of his time there. It seems he must have been quite a character. Submitted by Chatty Paddy on Mon, 06/06/2011 - 9:56am. The contractor whose name is on that small frame building, Isaac Blair, is still in business in the Boston and New England area. They've been bought by another company, but retain the original name. Submitted by Hillary on Wed, 06/01/2011 - 8:29am. Actually, to quibble with an early commenter, one thing remains from this photo -- the large kettle seen hanging at the entrance of the Oriental Tea Company. It was preserved during the demolition of this area and now hangs outside the Starbucks across from City Hall Plaza. Submitted by jegan on Wed, 06/01/2011 - 7:47am. The tea kettle in the photograph was made by my great-great-grandfather, Erastus Beethoven Badger, a coppersmith in Boston in the 19th century, and patriarch of a fairly prominent family in those days. Submitted by steamghost on Wed, 06/01/2011 - 2:24am. 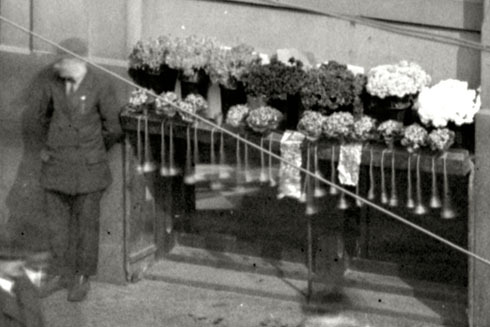 The man on the corner looks to be selling flowers. But what are the things dangling from his display? Submitted by Teacher1900s on Wed, 06/01/2011 - 2:15am. 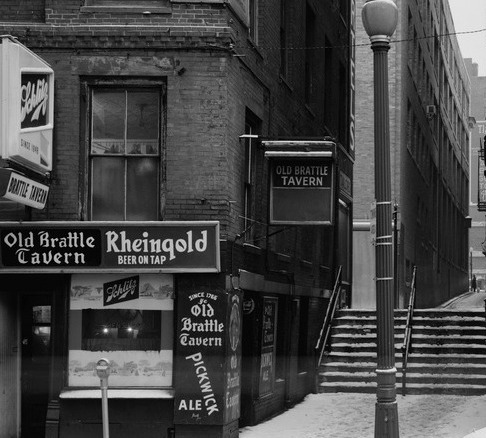 Below is a 1950s view from Brattle to Court via Ben Franklin Avenue or Way. (That's the alley that runs next to the former VA Clinic and now Veterans Shelter.) The map shows the 1850s layout in the area. Submitted by Dave on Tue, 05/31/2011 - 8:01pm. We're at the intersection of Brattle and Court streets. 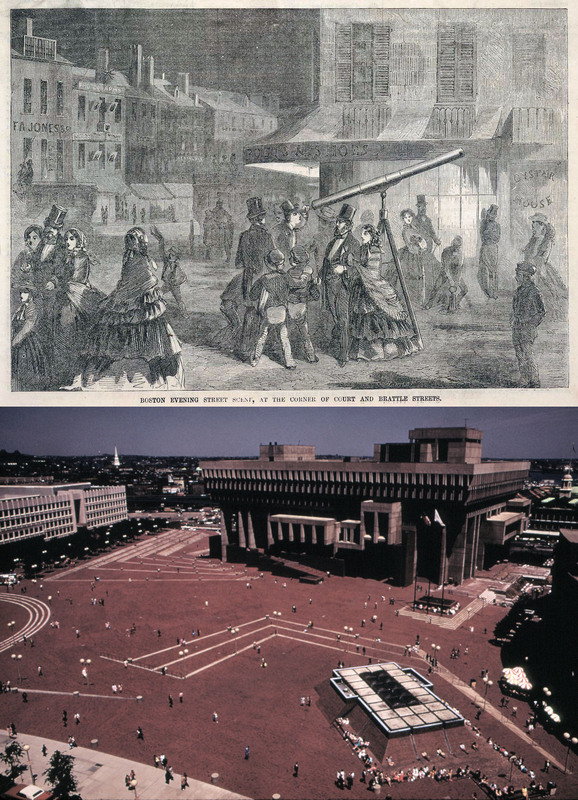 Subsequently paved over by the "Brick Beach" of Boston's lovely City Hall Plaza, according to several commenters. Submitted by Pudgyv on Wed, 12/07/2011 - 12:19pm. Brattle Street, center, running away from the camera. 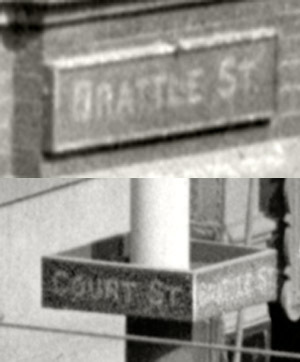 On the right can be seen the old entrance to the Brattle subway station. 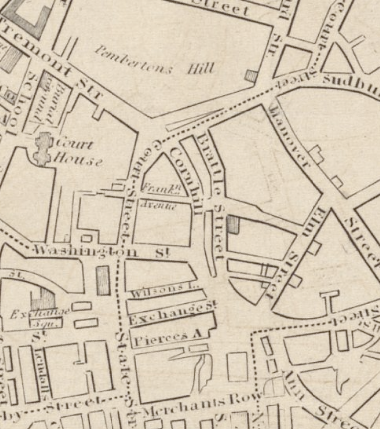 Though a part of the larger Scollay Square station it had its own name. Crawford house was the home base of the much beloved Sally Keith a dancer who had the ability to twirl tassels, one attached to each bosom, in different directions. Street construction due to extension of the East Boston Tunnel from a new station beneath the existing Scollay Station (replacing the old Court St. station) to a point near Russel St. and Cambridge St. Nothing in this picture remains. 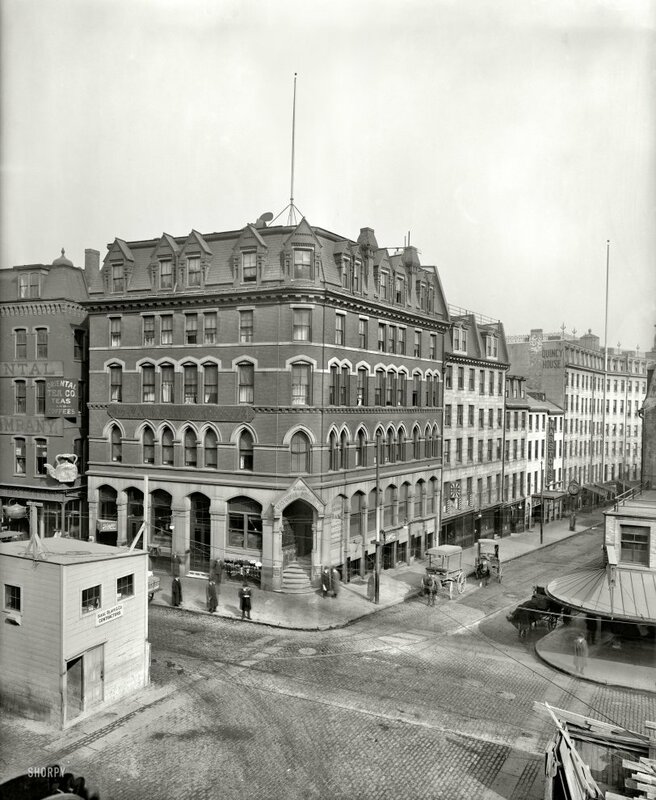 Scollay Square and the surrounding area was razed in 1963 in the name of progress. In truth, it was the theft of our heritage. Submitted by Bink on Tue, 05/31/2011 - 4:19pm. The ones on the corner may have kept the National Security Bank safe from violation, but I fear there will be an outraged shriek from the real estate office in a moment. Submitted by silverton on Tue, 05/31/2011 - 3:07pm. 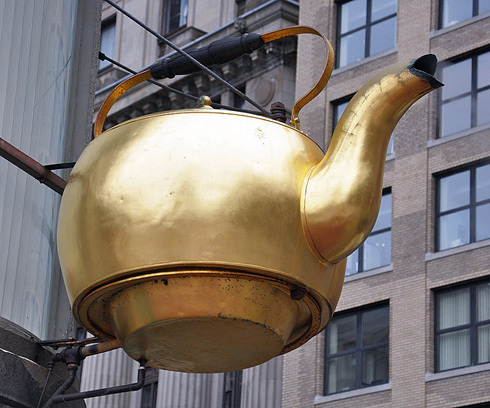 "The tea pot was a famous tourist attraction for many years. The reason is due to a huge publicity stunt. On January 1st 1875, a contest was held to guess the capacity of the kettle, and Boston's Sealer of Weights & Measures officially measured it." Submitted by Dave on Tue, 05/31/2011 - 2:45pm. 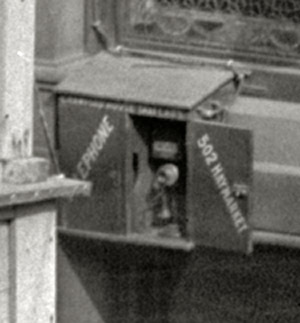 This might be the earliest pay phone seen on Shorpy. Submitted by Vintagetvs on Tue, 05/31/2011 - 2:38pm. I think that place on the left sells Tea.